Despite having lost an arm in the Civil War, Powell was an intrepid explorer of the American Southwest, especially the Grand Canyon and the Colorado River. 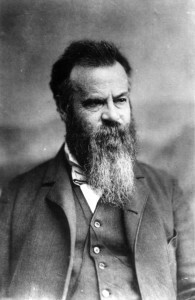 From 1871 to 1879, he led a federal geologic and geographic survey of western lands, in the process establishing many of the fundamental practices of geology. As an ethnologist, Powell published the first classification of American Indian languages. Appointed the first director of the U.S. Bureau of Ethnology (1879) and director of the U.S. Geological Survey (1881–1892), Powell was also author of Report on the Lands of the Arid Region of the United States (1878), a major landmark in the study of ecology.